Rajasthan Lab Assistant Recruitment 2018:- Lab Assistant Vacancy 2018 in Rajasthan, Rajasthan Prayogshala Sahayak Notification 2018 Download From Official www.rsmssb.rajasthan.gov.in. Rajasthan State Government recently announced the RSMSSB lab Assistant Vacancy 2018 if any Candidates, who want to join in Rajasthan Lab Assistant department, they can apply for this post. It is golden opportunity to get a Lab Assistant job in Rajasthan state government. Latest Update – RSMSSB ने राजस्थान में प्रयोगशाला सहायक के 1200 पदों पर भर्ती का ऑफिसियल नोटिफिकेशन निकाल दिया है ! रिक्रूटमेंट नोटिफिकेशन, ऐज लिमिट , एलिजिबिलिटी से सम्बंधित जानकारी निचे दी गयी है ! 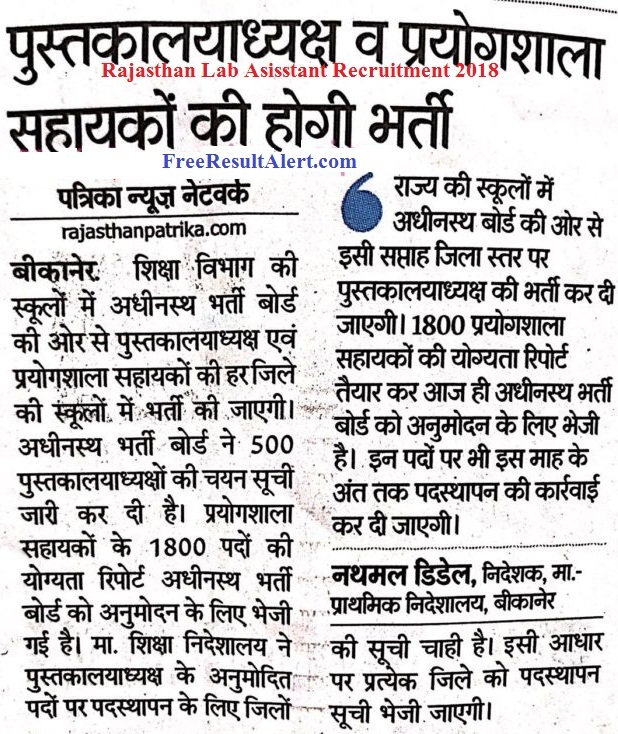 Candidates are advised that they should be properly read official notification of Rajasthan Lab Assistant Recruitment 2018 online form. Recruitment notification will gives you a complete detail. If you are eligible and interested then you can fill online application form from the official website. 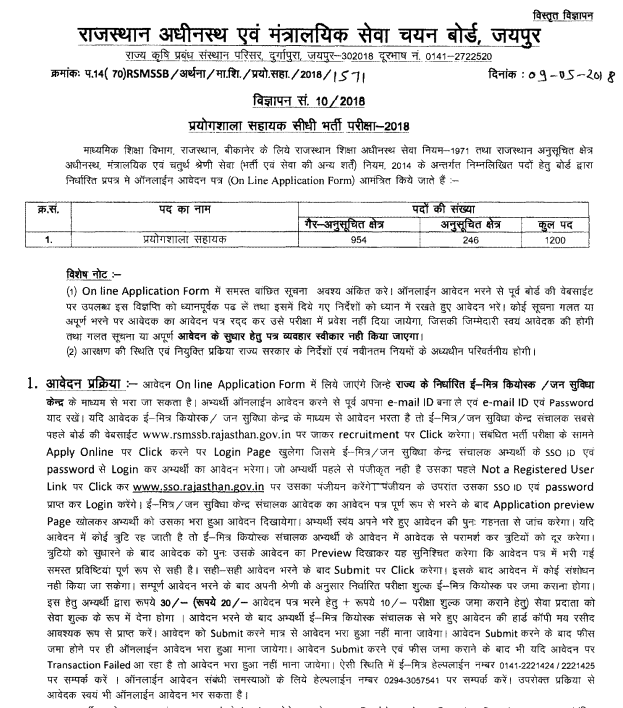 Here, You can Download the Lab Assistant Vacancy 2018 Notification From Below. Below You can see the Eligibility Criteria for the Lab Assistant Posts. This is just the Expected Eligibility Criteria for the Prayogshala Sahayak Vacancy. We provide all the details of Rajasthan Rajasthan Prayogshala Sahayak Vacancy Notification 2018 as soon as possible. As once the official RSMSSB Notification 2018 for Lab Assistant Releases. Then, we will update the Eligibility Criteria. Thank you so much for using our web site we promise you that we will update our website shortly with relevant information. Age Limit :- 18 to 35 years old as on 1st January 2018. Candidate should have Passed Minimum 12th from a Recognized Board with Science Subject. Candidate should have Studied Related Medical Courses. Must have knowledge of Hindi in Devanagri Script and Rajasthan Culture. First of all, Open the RSMSSB Official Website i.e. www.rsmssb.rajasthan.gov.in. Then, Scroll Down Below at the “Recruitment Advertisement”. There, Choose the Direct Link of ” Lab Assistant Notification 2018 ” Option. Also, Apply Online for Rajasthan Lab Assistant Application Form 2018 by Providing the Complete Required Details. Finally !! Submit Prayogshala Sahayak Online Form. Also, Take Its Printout.